Also known as Over Arley. Ernlege in the Domesday Book. 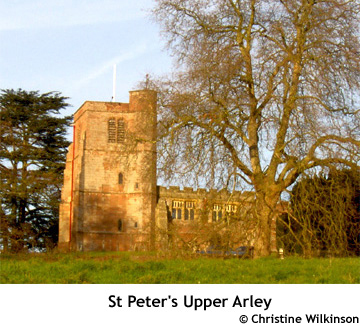 Upper Arley covers a mainly rural area in the north of Worcestershire. The River Severn flows through the parish and quite a large area, particularly to the west of the river, forms part of the ancient Forest of Wyre. A feature of the parish is the Severn Valley Railway, running along the west bank of the River Severn. Register of graves 1908 - ? ARELY (UPPER), a parish in the southern division of the hundred of SEISDON, county of STAFFORD, 5½ miles (N. W. by W.) from Kidderminster, containing 715 inhabitants. The living is a perpetual curacy, in the peculiar jurisdiction of the Dean and Chapter of Lichfield, and in the patronage of the Earl of Mountnorris. The church, dedicated to St. Peter, is situated on an eminence commanding a fine prospect. The village occupies a romantic situation near the side of the river Severn.